Heat a cast iron skillet over medium heat. Roast tomatoes in skillet for approximately 3 minutes per side. Rotate tomatoes when skins start to blacken. After tomatoes have roasted on all sides, remove from heat and set aside to cool. Remove skin. Place tomatoes, garlic, and onion in a blender and puree to a smooth consistency. Place a saucepan over medium heat, add corn oil and heat for 2 minutes. Add tomato puree, lower the heat to minimum and simmer for 15 minutes. Add TABASCO® Sauce and salt, and stir well to incorporate. Cook for 3 more minutes. Remove from heat and allow to cool. Salsa will have a thick consistency. In a medium bowl, prepare an ice bath and set aside. Using a broiler, or a gas stovetop with flame turned on high, char the peppers, turning them frequently until skins are blistered and blackened, about 5 minutes. Place peppers in the ice bath as you cook them to stop the cooking process. Wearing gloves, remove the peppers from the ice bath and peel off the burnt skin. Run peppers under cool running water to rinse away any burnt pieces. Insert a sharp knife into each pepper 1-inch from stem. Make sure the knife pierces the heart-shaped seed core. Push knife downward and core should pop off. Make a 2-inch-long incision starting from stem to create a small flap, but keep the pepper intact for stuffing. Gently remove seed core and rinse each pepper to remove any remaining seeds. In a large bowl, combine shredded chicken with 1 cup of Spicy Tomato Sauce and toss to combine. Season with salt to taste. Working one at a time, take each pepper and gently stuff with 2 tablespoons cheese, followed by 2 tablespoons of chicken mixture. Repeat to completely stuff all peppers. Close the flap. With a damp, clean kitchen towel, wipe off excess sauce. Place stuffed peppers on a sheet pan lined with parchment paper, wrap with plastic and refrigerate until ready to use. This can be made ahead up to 1 day. Using a mixer fitted with a whisk attachment, pour egg whites into the bowl and whisk to medium stiff peaks. Lower speed and add yolks one at a time. Place cast iron skillet over medium heat, add corn oil and heat to bubbling, about 3 to 4 minutes. Working one at a time, lightly dust each chile relleno with flour and dip in the egg batter. Place in hot oil and fry until golden brown, about 3 to 4 minutes per side. Place cooked chiles rellenos on paper towels to drain. Place uncovered in a warm oven while you work. 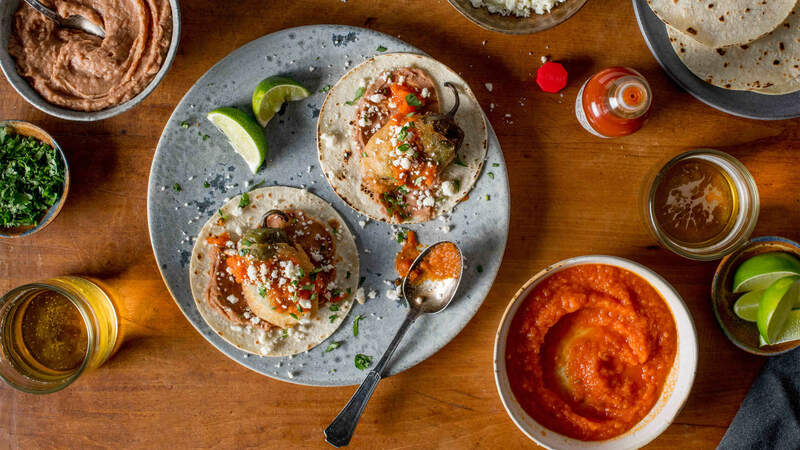 Smear 1 teaspoon of refried beans over a warm tortilla, place chile relleno in the center, and top with 1 tablespoon Spicy Tomato Sauce and 1 teaspoon queso fresco.